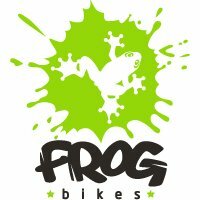 Frog have come from nowhere - they didn't exist two years ago (this review was written in July 2015) - to being our best selling kids' bike brand ever. Why? Because Frog have a winning knack for creating lighter weight, better spec'd but still competitively priced kids' bikes, which are easier to ride. So it goes with the Frog Tadpole balance bike. It has a more aluminium alloy rich spec than most. It's not just the frame. The forks, wheels, handlebars, brakes stem and seatpost are all strong, lightweight aluminium alloy too. A steering lock on the headset prevents the common rookie error of oversteering. The Tektro rear V-brake wouldn't look out of place on a £400 adult bike. This brake is mounted low and out of the way to avoid catching the young rider's feet. The Tektro junior brake lever is easy to use - even for the intended 2-3 year rider. The 12.5 x 1.75 inch Kenda hybrid tyres make for a comfortable smooth rolling ride. In a world where most kids' bike models come in just one colour, the Frog Tadpole is available in 5 different colour options: red, purple, orange, spotty and pink. Designed for youngsters aged 2-3 years with a minimum inside leg of 32cm. It's generally recognised that practicing on a balance bike is the easiest way for a child to learn that fundamental life skill - riding a bike. A balance bike has no pedals, cranks or chain. This means that the youngster learns how to steer and balance without fear of dunking their wee ankles on the pedals. The absence of pointy chainrings makes the balance bike an intrinsically safer introduction to cycling. The absence of an oily chain makes the balance bike a cleaner initiation too. Present a 2 or 3 years old with a balance bike and they almost always instinctively know what to do - jump on the saddle and scoot along the pavement, hobby horse style. Once the youngster gains confidence, he or she can rest their feet on the wider chainstays and experience one of life's most enduring pleasures, freewheeling (or, as Americans put it, just coasting along). If they need to slow down or stop, it's equally instinctual for kids to realise when it's time to get their feet back on the ground. When it's time for the youngster to graduate to the next level - their first bike with pedals - they're already almost there. They can balance. They can steer. Pedalling is then a natural progression that the young rider quickly adapts to. We obviously believe that balance bikes are an all-round good thing. Check them out and we're sure you'll agree. Enjoying life to the full is simply a matter of finding the right balance.